Have you heard of Rhockett Weaving or the Rhockett Retreat? If you are a babywearer you NEED to check it out. 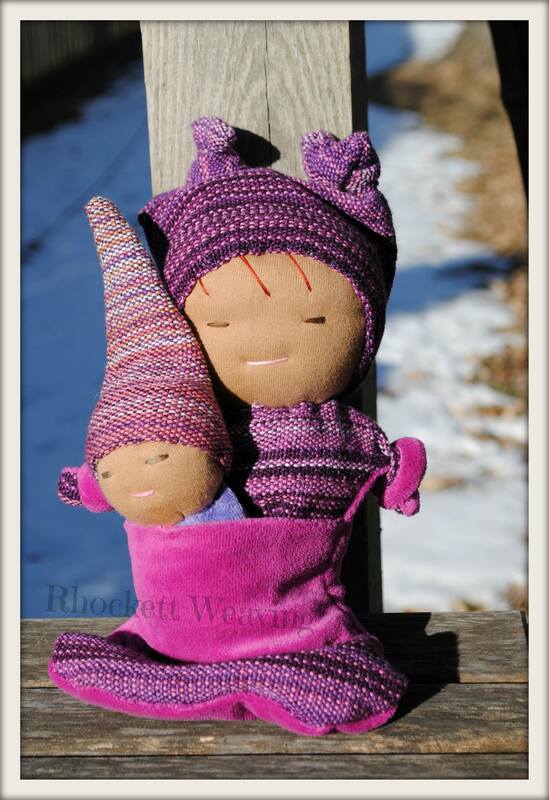 Rhockett Weaving is owned and operated by Rhonda Brackett. After she fell in love with babywearing and discovered it was a necessity in her life, she began creating her own signature style wraps. She also takes custom orders, if you are wanting something really special. This April, is the very first Rhockett Retreat. This is a place where people come together, who love wrapping as much as you! There will be good food, henna from Alternative Artistry, babywearing yoga, babywearing art, campfires & s’mores, and MORE! There will be classes through out the the three-day, two-night event including weaving, dyeing fabric and learning different wrapping instructions. You can also check out some awesome local vendors such as Finnabug Bags, Starbright Baby, and Alternative Artistry. You can come by yourself, you can come with your little one OR you can bring the entire family. Not everyone needs to attend all the fun classes, but there will be no child supervision provided. There is also a charge for each additional person, to cover room and board. This years Rhockett Retreat is being held in Ogden, Iowa. You can choose to stay the entire time or drive for only the day on Saturday and/or Sunday. You can register here for whatever option you choose! If you register for the entire retreat you will receive a FREE swag bag! 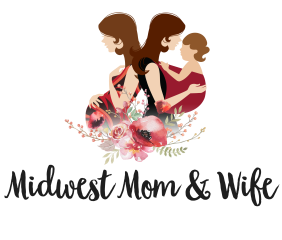 To help get everyone excited about this fun babywearing retreat, we are doing a GIVEAWAY! 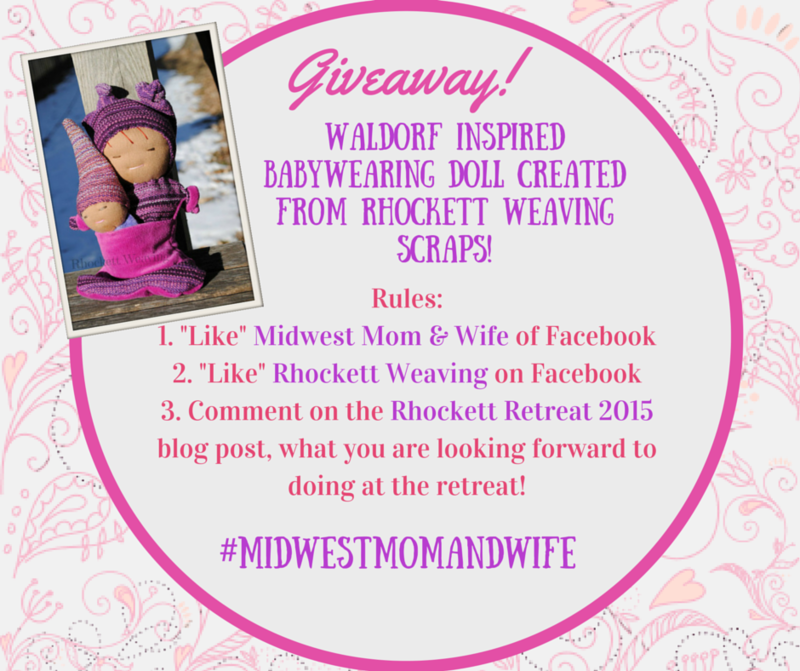 One lucky winner will win a waldorf inspired babywearing doll created from Rhockett Weaving scraps! The contest begins TODAY and will end Friday, March 13th! I will post the winner on my Facebook page. Good luck! Im excited to see a loom in action in person! I’m most looking forward to weaving classes!! i am so looking forward to meeting friends I only know online! Would love to do some Babywearing yoga! Me too! I have never done babywearing yoga or any exercise class before. Have you? I am to far to attend, but can’t wait to see all the adventures on facebook and the blog! I can’t wait for everything!! Weaving, dyeing, wrapping, wrap petting, girl time, food I don’t have to cook!! I am REALLY looking forward to girl time too! Looking forward to a weaving class and leaning about different fibers. And a wrapping class couldn’t hurt either! I am also looking forward to a wrapping class! I have never wrapped before. I am usually using a Tula or Mei Tai! I look forward to meeting you! I’m in Florida, rural town where babywearing is rare. I’m super jealous of all the friends that will be made, the beautiful henna that will be done and the smores that will be eaten! Maybe I should plan a road trip! Thanks for entering! I hope someday you are able to make the trip to Iowa! Really, though. This is the first thing I’ve done for myself since having children. I’m excited for all of it! i would love to go, but can’t (dumb schedule for hubs’ classes!). I would have loved to do the dyeing portion! So jealous of the people going!